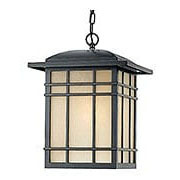 With it's clean lines and crisp angles, this versatile porch light works with Mission, Asian or contemporary style homes. The textured black finish and white linen glass soften the bold effect. 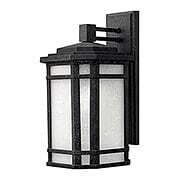 Made of weather resistant cast aluminum. 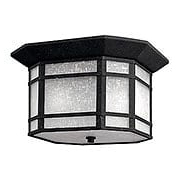 With it's clean lines and crisp angles, this versatile porch light works with Mission, Asian or contemporary style homes. A textured black finish and white linen glass soften the bold effect. 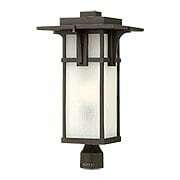 Made of weather resistant cast aluminum. 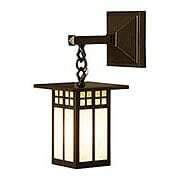 With it's clean lines and crisp angles, the versatile Cherry Creek Large Entry Light works with Mission, Asian or contemporary style homes. A textured black finish and white-linen glass soften the bold effect. 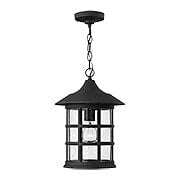 Made of weather resistant cast aluminum. The Tahoe lighting series brings classic Mission styling into the 21st century. Recalling the Prairie School designs of Frank Lloyd Wright, this crisp and geometric entry light features distinctive bands of hand-crafted art glass. A deep bronze finish complete the vintage effect. The Tahoe lighting series brings classic Mission styling into the 21st century. 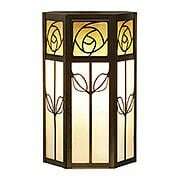 Recalling the Prairie School designs of Frank Lloyd Wright, this crisp and geometric porch lantern features distinctive bands of hand-crafted art glass. A deep bronze finish complete the vintage effect. The Tahoe lighting series brings classic Mission styling into the 21st century. 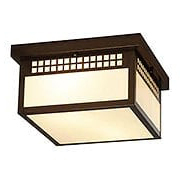 Recalling the Prairie School designs of Frank Lloyd Wright, this crisp and geometric porch light features distinctive bands of hand-crafted art glass. A deep bronze finish complete the vintage effect. 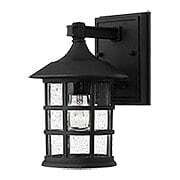 The Tahoe Wall Mounted Porch Light brings classic Mission styling into the 21st century. 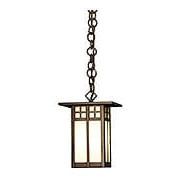 Recalling the Prairie-School designs of Frank Lloyd Wright, this crisp and geometric porch light features distinctive bands of hand-crafted art glass. A deep-bronze finish completes the vintage effect. Brass rivets provide both structural integrity and decorative detail in these fixtures inspired by the works of Dirk Van Erp and Gustav Stickley. The bold peaked roof of this series provides a beautiful accent to Craftsman, Tudor and contemporary architecture. Hand made in the USA of solid brass and art glass. Fixture measures 12 1/2" tall by 5 5/8" wide and is available with two glass color options. UL damp rated for covered exteriors. A subtle blend of Swiss Chalet, English Tudor and California Mission styles are skillfully married in this series. 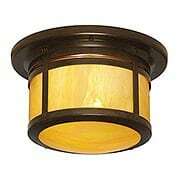 Hand made in the USA of solid brass and art glass. 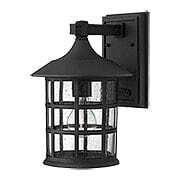 Fixture measures 10 1/2" tall by 7" wide and is available with two glass color options. UL damp rated for covered exteriors. Inspired by the designs of C.R. 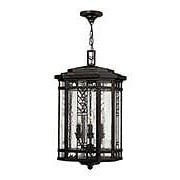 Mackintosh, these Japanese influenced fixtures are at once contemporary, yet traditional. Hand made in the USA of solid brass and art glass. 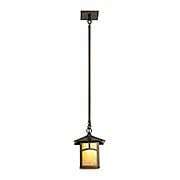 Fixture measures 13 5/8" tall by 6" wide and is available with two glass color options. UL damp rated for covered exteriors. 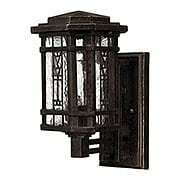 Make a bold statement with this rustic wall fixture. 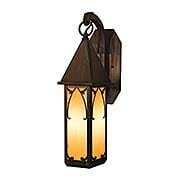 With its steep roof and artistic filigree frame this sconce harkens back to medieval times. 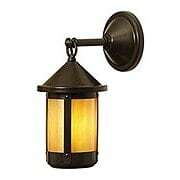 Hand made in the USA of solid brass and art glass. 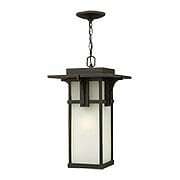 Fixture measures 17 3/4" tall by 7" wide and 10 3/8" in depth. UL wet rated for exterior use. A subtle blend of Swiss Chalet, English Tudor and California Mission styles are skillfully married in this series. 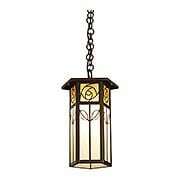 Hand made in the USA of solid brass and art glass. 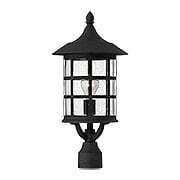 Lantern measures 9 1/2" tall by 7" wide and is available with two glass color options. UL damp rated for covered exteriors. 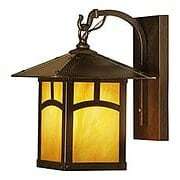 With it's clean lines and crisp angles, this large and versatile porch light works with Mission, Asian or contemporary style homes. A textured black finish and white linen glass soften the bold effect. 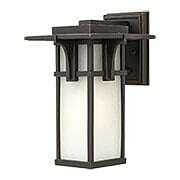 Made of weather resistant cast aluminum. 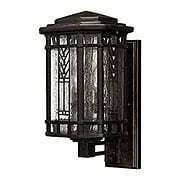 The Manhattan Outdoor Wall Light's unique bracketed design recalls Mission furniture of the early 20th century. 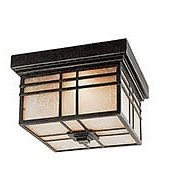 Crisp and angular, with an olde-bronze finish, it is the perfect lighting accent for Arts and Crafts style homes. Cast from durable, weather-resistant aluminum, with etched, seedy glass and your choice of standard incandescent or eco-friendly LED lamping options. 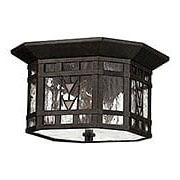 The Manhattan Outdoor Post/Pier Light's unique bracketed design recalls Mission furniture of the early 20th century. 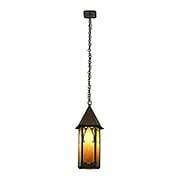 Crisp and angular, with an olde-bronze finish, it is the perfect lighting accent for Arts and Crafts style homes. 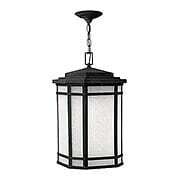 Cast from durable, weather-resistant aluminum, with etched, seedy glass and your choice of standard incandescent or eco-friendly LED lamping options.